Hope you're having a good day! 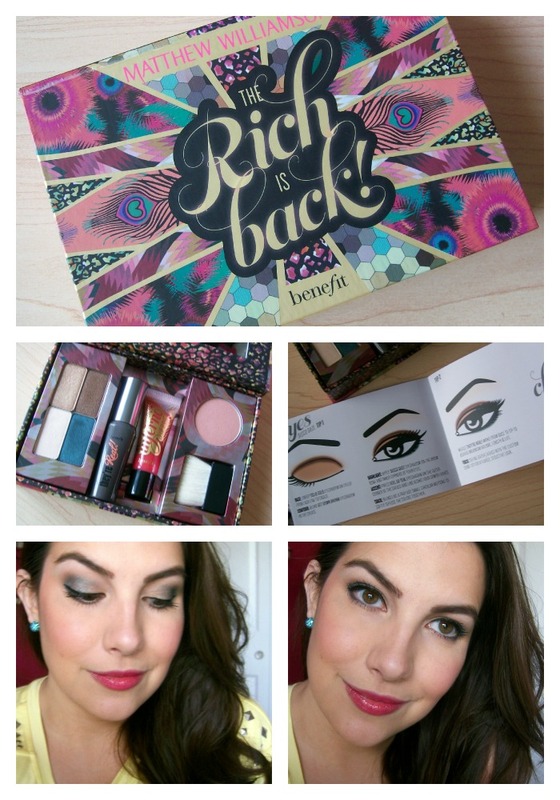 I recently received this kit in the mail from Benefit to try- it's called "The Rich is Back!" 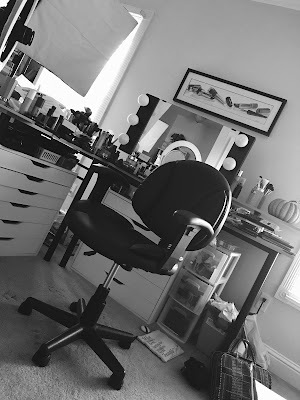 I talked about it briefly today on Beauty Broadcast Live, but wanted to give you some more pictures and details in this blog post. Benefit collaborated with British fashion designer Matthew Williamson for this limited edition kit. It's said to contain rich shades that take you back to the disco era. The kit comes in a little mirrored box, and I absolutely love the fun, retro look of the packaging! Inside, you have four eyeshadows, a They're Real! mascara, a lip gloss in Inferno, a cheek powder in Gimme Fever, and a brush. As with most of Benefit's boxed kits, the tray holding the products lifts out, so the box itself can be re-used for other things. Sorry that this picture isn't crystal clear- and now my camera is charging so I can't re-take it! (you can also see a bit of the burn on my hand- oops). Overall, I love the choice of shades that were included- the deep teal is a really fun color! As far as the texture, all of the shades have shimmer, and the white and gold colors are quite sheer. I really had to pack the gold shade to make it show up, and I was using a primer underneath. 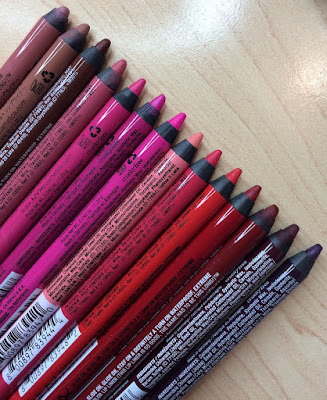 The brown and teal shades are more rich and pigmented- suitable to use as crease shades or smudgy liners. As for the gloss, it's the same formula as the other Benefit squeeze tube glosses that are named after the various boxed powders (Coralista, Sugarbomb, Dallas, etc.) I've said in the past that the formula is not sticky at all... and I actually wouldn't mind if it was a little more sticky so it could better cling to the lips. The staying power isn't great, as I noticed when I was wearing it during the first part of Beauty Broadcast Live. The color is buidable... you can apply it lightly for a sheer red, or build it up for more intensity. Overall, I love the shade, just not so much the texture. I enjoy Benefit's They're Real mascara! Ever since this rubber-bristle wand came out with the little nubs on the end, a number of other mascaras have tried to do something similar, but often they're too short. Benefit's is really nice because those bristles on the tip are long enough to actually be used to help separate and flare out the lashes. As with most mini mascara wands- you're getting the full-sized brush on the end... They're Real's brush is rather large to begin with, so with the shortened wand, you may have a little difficulty really getting in there to all the lashes. But that nice little tip does help (just make sure to wipe off the excess product when you pull it out of the tube). This mascara is super lengthening, yet it doesn't seem to weigh my lashes down. I have a full review on this mascara on my YouTube channel. While I think this mascara is an asset to this kit, you could get a similar look from lengthening mascaras from the drugstore - like L'oreal Double Extend. The kit also comes with a little brochure if you want ideas for ways to use the products. For my look, I'm wearing a couple of coats of the gloss and the cheek powder as a highlight on the tops of my cheeks/cheekbones. For the eyes, I applied the lightest shade around my inner corner and under the brow. I used the gold on the inner part of the lid, and also on the inner part of the lower lashline. Then I added in the teal all over the lid and into the crease. I smudged the teal under the outer part of the lower lashline, too. I finished the look with a couple of coats of They're Real mascara. Also, my shirt is from Forever 21, and the earrings are from New York & Company. I hope this review was helpful to you! Overall, I like this kit but I don't love it. I like the addition of shades that are a bit more bold and "rich" (as the name says :), such as the teal shadow and the berry/red lip gloss. They're Real mascara is a favorite of many, and I thought the cheek powder gave me a nice, soft highlight. Still, I don't think these shadows are as good as other high end brands like Urban Decay or The Balm, and the gloss formula isn't my favorite. Also, I had to bring in a separate blush to actually give my cheeks some color. This costs $34 on Benefit's website. It's a little pricey, but I could see it as a fun gift idea for a fashionista friend who likes to try everything! :) Have you used this kit yet? What do you think? The sky is starting to cloud up... I'm thinking rain is on the way. Guess what I'm drinking? Green tea. Robin update: The birds seem to be out and about now, not spending so much time in the nest. Maybe now I can trim the bush/small tree they've been living in! Thanks for your honest review! I love Benefit Cosmetics, they have such cute packaging, I might have to test out this set at my local sephora to see if I want to purchase it! Oh, I am loving the look of this! Those eyeshadow shades are gorgeous - and you can't go wrong with that mascara. It is my favourite! love your reviews so much! I love these little kits! So great to be able to try a small version of some of their products just to be sure they suit you. Thanks for the review! The swatches for the eyeshadows look gorgeous! I probably won't pick it up though unfortunately, I'm not sure if I'll actually use it. I have, however, been dying to try the mascara D:. Any help my lashes can help would be wonderful! Too bad these colours don't have better pay off. I really love kits that have a bit of everything in them. I cant say I love the colors too much so that's disappointing but another great review as usual! Great review. I love Benefit (especially the boxed powders and the packaging for everything) but I think I may skip on this. I would rather purchase a full size of the mascara (one of my FAVS) and go for like you said, UD or theBalm eye shadows. Thanks for giving a honest and thorough review! This looks awesome,,,considering I need to buy more of the mascara anyways!! Wondering if we can find a dupe for that teal color. I MUST have it!!! I just don't want the whole package. Anyone have any suggestions? Emily?